Healthy Heart – Red wine is rich in polyphenols which is an ingredient that keeps blood vessels flexible, thus preventing stressing of the heart. This is also one the reasons why red wine plays a role in preventing strokes as well. The presence of flavonoids and saponins works further to prevent numerous other cardiovascular diseases mainly heart attacks. Lowering Bad Cholesterol – Red wine has been linked directly with lowering bad cholesterol in blood. In fact, in a certain carefully conducted study, it was seen that people with high levels of bad cholesterol experienced a steep drop by 9% to 12% after being introduced to a glass of red wine for a few good weeks. Besides lowering bad cholesterol, Red wine tends to increase HDL, which is a form of good cholesterol functioning for the better of the body. Antioxidant Benefits for Glowing Skin – Power packed with anti oxidants, red wine works miracles when it comes to adding glow to the skin as well as reversing the aging process by a certain degree. It has often been observed that moderate level wine drinkers get wrinkles, fine lines and other such symptoms of aging much later than their counterparts. Improving Brain Health – Red Wine contains a certain compound called Resveratrol which plays a role in preventing cognitive decline of the brain. Thus, it keeps the memory sharp for longer and is also instrumental in keeping brain disorders like Alzheimer’s disease at a comfortable distance. Resveratrol has been seen to counter the formation of beta-amyloid protein which is the key ingredient in forming brain plaque that is usually present in people suffering from Alzheimer’s disease. 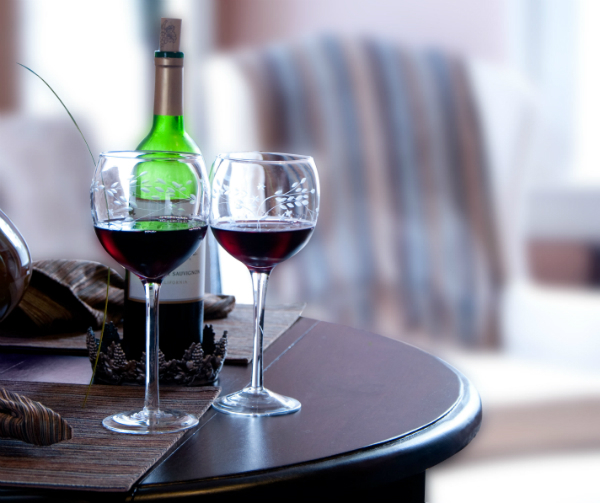 At the same time, red wine is also known for improving the quality of sleep. This can be owed to a certain component called melatonin which caters to the cause. so, by promoting memory and brain health, while offering ample rest to your mind, red wine can be termed as a blessing for overall mental health. Great for Eyes and Teeth – Red wine is also known for being great for eyes and teeth. It has been seen through study that drinkers of red wine are less likely to develop cataract than their non drinking counterparts. At the same time, it is known for strengthening the enamel of the teeth while reducing inflammation of the gums significantly. Preventing Cancer – The multifunctional ingredient Resveratrol is also known for retarding the development of cancer cells. Red wine has till now been linked with successfully eliminating risks of breast and lung cancer.